Embark on an unforgettable stay at Renaissance Orlando at SeaWorld . Our enviable location, thoughtful amenities and sophisticated event venues make our hotel a compelling choice for travelers of all types. Relax in our spacious guest rooms - many of which are the largest in Orlando - and then explore all the fun on and near our resort. Bask poolside with a tropical drink in hand while the kids cool down at our on-site water park, complete with water slides, toddler play area and more. Savor delicious dining in our multiple restaurants and Toppers Creamery , or make time to refresh with a spa treatment at Privai Wellness + Spa, located on our second floor. If business or an event brings you to our resort, you'll appreciate the comprehensive services available in our over 200,000 square feet of indoor and outdoor spaces. Whether joining us for a family vacation to SeaWorld or on a romantic escape to Florida, we look forward to welcoming you to our inviting resort in Orlando. Tradewinds Restaurant: Indulge in your favorite comfort foods updated with an upscale, modern twist in our welcoming restaurant. Begin your day with a delicious breakfast buffet, or join us later for great burgers and handhelds, fresh seafood and tempting desserts. Mist Sushi and Spirits: Take some time to relax and savor our lobby restaurant's creative light bites, perfectly prepared sushi and unique cocktails. 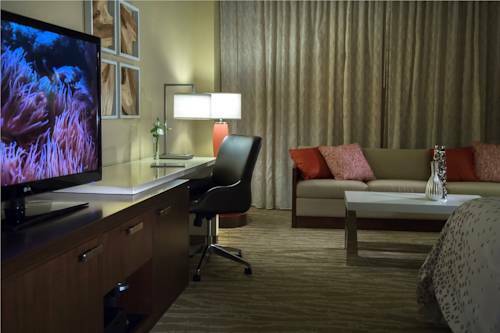 This casual setting is the ideal spot to re-energize after a busy day of meetings or sightseeing in Orlando. Boardwalk: Catch your favorite team in action at our lively sports bar near SeaWorld while enjoying a refreshing beer or cocktail. Indulge in our tempting and diverse food menu, from our Brisket Chili Frito Pie to our delicious House-Smoked Wild Isles Salmon. Palms Pool Bar & Grill: Enjoy the dazzling Orlando, Florida sun with the whole family on our lively pool deck. Indulge in Palms Pool Bar & Grill s sandwiches, burgers and refreshing drinks, while the kids take a refreshing dip nearby in our pool. Starbucks : Order your favorite coffee beverages at our on-site Starbucks . This full-service outlet offers a complete range of La Boulange pastries, bagels and more to take along on your adventures at SeaWorld and other attractions near our hotel. Toppers Creamery : Indulge in the Best Soft Serve Ice Cream on the Planet "! Whether you prefer it plain, or smothered in delicious candy and other toppings, you'll love every bite of our fresh ice cream treats.